Back in the 1990s, I was one of the very first professional VR creators. We used Apple’s QuickTimeVR and then other technologies to create virtual tours of spaces like the Major League Baseball stadiums, the Olympics, and for some nifty ‘Matrix’-style work for Sprite. Early VR was so cool and unlike anything else back in ‘flatland’. Funny thing. It was really effin’ hard to make money doing it, because except for a few ad agencies and forward-looking companies, nobody saw much need for it. And then a decade later, Google’s mapping vehicles implemented a not-very-good version of this first-generation VR for their ‘street view’ on Google Maps. I mean, part of me was like ‘yay! VR for anyone!’. But boy the quality was and is, even in 2016, pretty crappy. So now we have a few new flavors of VR being ultra-hyped by the electronics makers and the press. Well, they aren’t exactly new flavors at all. But they’re arguably slightly improved from the early 2000s versions of 360 degree video I used to do. The resolution’s a bit better, in some cases, at least. And the 3D aspect’s cool if you can get it to work. 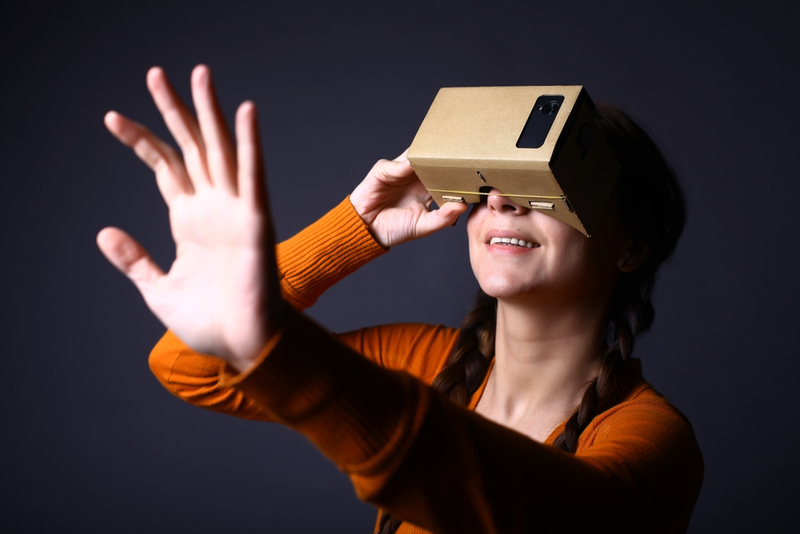 And Google Cardboard’s pretty bitchen’. So VR is back, bigger and badder than ever. What can we do with it? Well, first the obvious- people love to see places they couldn’t otherwise visit in person. As always. Since forever, like when the picture postcard was invented. One of my friends who is trying to get a VR business off the ground has been posting about how VR will overtake the ‘dying’ art of the movies. I think he’s being a little disingenuous, because he’s not a dumb guy. What VR is good for is showing us real-life (or 3D worlds), and giving us choices on ‘where to go’. Movies are anything but real-life, and the tools cinematographers use are intended to absolutely force you to experience the story the way the filmmakers intended. VR and movies are two very different things, tied together by some shared tech and the idea that possibly you could use either for telling a story. Short-form stories can be neat in VR, sometimes. Very, very sometimes. Just don’t think VR is an upgrade to movies. VR is something entirely different, and it needs time to develop its own rules and conventions to get the most out of it. We’re not there, yet, and most stories can’t be told nearly as effectively in VR as they can using the oldschool filmmaking ways. Some people say movies were once like this- short little clips, no real story except ‘get the eff out of the way of that train!’. And they’re right! So, yeah, I’m excited (a little) to see where VR goes. It’s still as cool when you first see it as when I first got involved. But cool isn’t enough, and I’m not onboard for the hype and BS. If VR is to become something more than a sideshow, we need to figure out how to use its unique strengths. One of the worst ideas in VR is using it to try and ape what works for another medium. Will we get enough of a push and enough time to make VR mainstream this time? I hope so, because I have clients who could use VR today to help sell their products and services- if there were a big enough audience to justify the expense creating the VR and promoting it. But my clients mostly say that right now VR feels like what we got with 3D TV a few years ago. And we know how that turned out. Still, a guy can hope.